This Cookie Cutter and Pasta Cutter Giveaway is for an assortment of both. 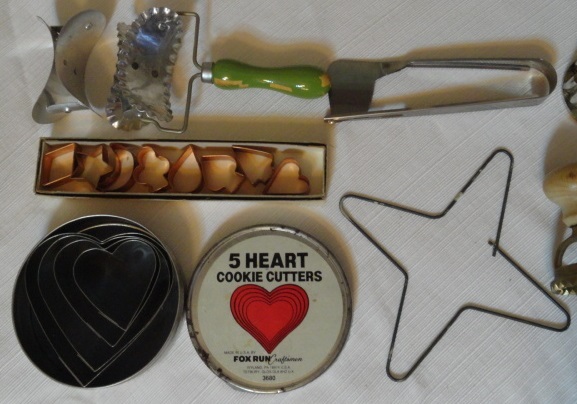 There are several cookie cutters and the green handled item is a pasta crimper with a changable blade. The brass piece is for pasta also. This is a very good assortment and would look great in any vintage or retro kitchen. Keep Checking Back For More Great Giveaways! To enter this giveaway the rules are very simple. Leave a comment in the “Comment Window” below with your name as it is in your Facebook account. The Giveaway ends Midnight of Dec 25th. We will not be announcing the winner until the 26th. You will be notified by email and you will need to respond by the 29th or we will draw a new winner. If you haven’t already we would appreciate it if you would remember to go “LIKE” our Facebook Page. This is a nice assortment of vintage Cookie and Pasta Cutters. Thank you for stopping by Back Roads Living again. We hope you enjoy your Cookie Cutters!.